The large coniferous forest found in Canada is called the Taiga. 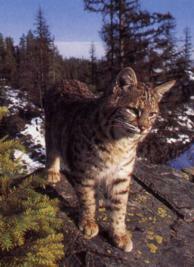 There are many swamps, mountains and forests in the Taiga that are home to the Bobcat. Throughout much of the United States the bobcat lives in forests, but can also be found in desserts and chaparral. A bobcat's body is about two feet long, and its tail is approximately four to eight inches long. The bobcat gets its name from it's stubby tail. A bobcat's weight range is between thirteen and twenty three pounds. It stands twenty to twenty four inches tall. A bobcat's paw print is a little over an inch wide. he winter and reddish brown for the summer. The baby bobcat has spotted fur that disappears when they get older. The bobcat's head is small and its ears are large. The face of the bobcat looks a lot like a house cat, but the body is taller and slimmer. The teeth of this cat are sharp. The canine teeth are long and are used to stab the prey. The back teeth are scissor-like so they can cut through the meat and hide. The bobcat's claws are designed to help it climb and catch its prey. These claws are very sharp and can be pulled inside their toes. The bobcat can run very fast, up to 30 miles per hour, but it prefers to walk. The bobcat has a special technique for running fast to catch its prey. It puts its back feet into the front feet's spot. If the bobcat is walking on leaves and twigs that would make noise this technique also prevents it from making any sound, and makes it a very quiet hunter. Bobcats are loners, and they keep separate territories. The male's territory can be as big as forty square miles. A male can have two or three females living in his territory. The male mates with all the females. He will father all the litters and he is responsible for feeding the mother and the kittens. Mating season is in the spring and females have two or three kittens each year. The kittens stay with their mother until the fall. They are born with their eyes closed and open them when they are ten days old. The young kitten drinks its mother's milk until about two months old. When they are five months old, the kittens learn to hunt with their mother. The kittens will stay with their mother for six to nine months. Two adaptations of the bobcat are sharp claws and teeth. Both of these help it hunt. Its fur changes color with the seasons, and helps it blend in with the colors of the season. The bobcat is common in North America, but it is rarely seen due to its camouflage. The bobcat's ears help it hear the quietest sound of its prey by swiveling front to back. Bobcats have little tufts of fur on top of their ears and this may improve their hearing the same way cupping our hand to our ear catches more sound. The bobcat is a carnivore. It eats mice, squirrels, rabbits, and game birds that live on the ground, like grouse. The scissor like teeth help it rip up the meat and eat it. The bobcat sneaks up on its prey, close enough to catch it in one pounce. Jack rabbits are too quick to be caught, so the bobcat eats mostly snowshoe rabbits and hares. A bobcat is mostly a predator, rarely a prey. It keeps the population of mice, squirrels, rabbits, and game birds down. The bobcat feeds on animals most people think of as vermin. The bobcat is not endangered, it is on the Least Concern list. About one million live in North America. There are so many because they are so adaptable to different habitats and prey - they can live in forests, swamps, mountains, and deserts. "Bobcat (Lynx rufus)", http://www.cathouse-fcc.org/bobcat.html, (November, 2000). "Bobcat (Felis rufus or Lynx rufus)", http://pelotes. ;ea.com/Animalfact/Mamal/bobcat.htm, (November, 2000). "Bobcat", Wildlife Fact File USA.